So, so helpful! I had this problem just yesterday–the comments and deleted text were all styled as gray text, which made them difficult to read. Now I can change them to black before I send the files to the author. Thank you! Thanks, Patti, I’m so glad I could help. However, do watch for Word’s nasty habit of not carrying customisations across to the next user! I have found that changes to commnent boxes, because they are changes to an actual STYLE, do tend to work, but I have also found that if a document wants to be awkward, it will carry on being so. So you might want to document what changes you made, or point your author here, just in case it continues to play up! It’s 2015 and your post is still helping Word-mongers around the globe. This one’s from Baton Rouge, Louisiana. Thanks! That’s nice to know – thank you! Thank you Liz for that helpful lesson. Ooh, a friend from another place entirely! Thank you for posting this comment and I’m glad it’s helpful! Is there a way to change the Default Balloon Text font size on a computer? I would like to see if a setting can be changed (ie default), so that when a user receives a document with tiny comments, the font size will automatically be changed to the default (ie a readable font size). Hello Brad and thanks for your comment. Unfortunately, all of the options in track changes and comment balloons are peculiar to the computer upon which the document is being viewed. There is no way that I or any of my editor pals have found to make a default apply particular settings to a document so that it will stay the same when viewed on another computer. You can try this yourself by changing the settings then opening it on a laptop or other computer – it defaults to that particular computer’s settings. Sorry! I tend to send a link to my posts on customising comment boxes along with the document if I know someone has had trouble before! I was working on a document in which the text was running right to left in the comment boxes. In the process of trying to figure out how to change that–before I found your site–I changed something that is now causing the reviewing pane to open twice, once in the left column and then again across my document, so now my whole document is covered. The second pane also seems to set at the bottom of the document, but when I scroll a little, it disappears. Has anyone got a solution to change this back to the default setting? Thanks. Have you looked at the track changes options and unticked all viewing panes options that you don’t want? It does sound as though the document might have got corrupted, in which case you might want to copy and paste into a new document, although you will then have to do a compare to retrieve your tracked changes. I hope that helps! Thanks, Liz, but the problem is not in the track changes options. Is there a way I can send you a screenshot? You can send it to liz@libroediting.com but I can’t promise anything! All I need to know is how to change the initial on the comment box – my initials aren’t coming up! How can I make disappear the box showing “usere date/time deleted or inserted” when i put the cursor over edited text (track changes)? Thank you for your question. 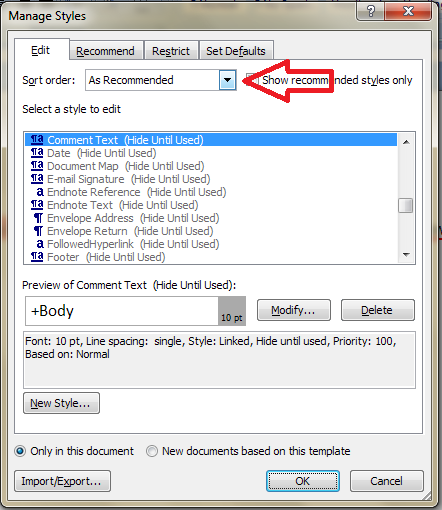 If you’re in Word 2010 or 2013, go to File – Options – Display and untick “Show document tooltips on hover”. If you’re using Word 2007, click the round button at top left, choose Word Options at the very bottom of the dialogue box, then as above – Display and untick “Show document tooptips on hover”. This should be clear, but I will write up a post with screenshots later this month. Thanks Liz for the info. It worked well. You’re welcome – I’m glad to help! This was VERY helpful. The most helpful thing was the graphics. Thank you! You’re welcome – thanks for taking the time to comment! I often need to collect comments from multiple reviewers on multiple teams, then send to a writer. Is there a way that word can combine multiple comments to attribute them to one reviewer (such that each person on Team A’s comments are listed as from “Team A” in the final version I send?) Thanks! Thank you! unfortunate about the balloons, but the workaround for track changes may help. Thanks again! You’re welcome – glad I could at least partly help! I cannot see the names of the editors in the bubbles, only when I hover over the changes in the paragraph. How can I change it to where I can see them? Thanks for your question, Stacey – that does seem a bit odd. Make sure that everyone has their initials / names set up in their versions of Word https://libroediting.com/2013/11/13/how-do-i-change-my-initials-in-word-2007-2010-and-2013/ and that you have Reviewers ticked and displaying in Track Changes – Show Markup. I hope that helps – let me know if it doesn’t and I’ll have a think. Hi. Thanks for this post which was really clear and has helped. One extra question though: is there a way to change or delete the default where every comment starts with “Comment [initials]”? I really don’t need every comment to be labelled ‘comment’, or numbered, and even if I want a label, sometimes a different one might be useful. I knew how to change initials – maybe by reading your page before! Shame about not being able to get rid of the “comment” – oh well…. Thanks for the quick reply. Much appreciated. Yes, people don’t realise you can change the initials to anything you want to! Glad to have helped partly, anyway! Liz, I was directed to this post by Katharine O’Moore-Klopf in hopes that it would fix my issue. Unfortunately, it hasn’t. In most documents, my MS Word comment bubble text shows up single-spaced (I believe this is the default and certainly my preference). However, I’ve recently begun work for a new client and whenever I insert a comment in one of their documents it shows up as double-spaced. Does anyone know how to change the line spacing for comment text? I’ve done a Google search and all I can find are references to the “Comment Text” style—unfortunately, that style says single-spaced so it must not be the problem. I have MS Word 365 (which is basically Word 2013), but I have a feeling this issue would occur with earlier versions too. Do you have any suggestions? Any help would be appreciated. Thanks for your question, Louann. Have you tried Balloon Text and looking at the spacing there? 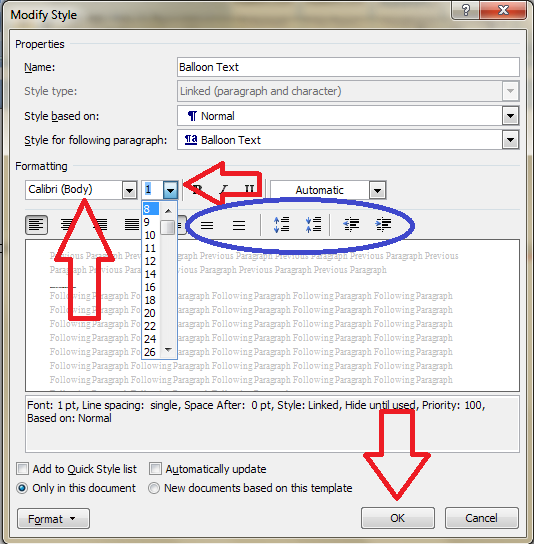 In all styles, you can access the line spacing by clicking on Modify, then Format, then Paragraph, in which case you find the line spacing and Space Before and Space After options (for some bizarre reason, you can change the Before and After spacing using the buttons with green arrows on them on the first Modify screen, but you have to go into Format – Paragraph to get the line spacing option). I hope that helps – let me know if not! Ahh, I found the answer to my question (see above) at http://www.internationalskeptics.com/forums/showthread.php?t=235700! I added Japanese as an editing language (but didn’t install the corresponding proofing tools which would cost $ and isn’t necessary). Now, I just have to right-click on any comments that show up as double-spaced and uncheck the box next to “snap to grid when document grid is defined.” Once that one comment balloon is showing up single-spaced (the default and my preference), I can highlight it, right-click on the Comment Text style, and choose “update comment text to match selection.” That fixes all of the comment balloons in the document! Goodness me, I don’t think I’ve ever seen that solution before, so thank you for sharing in case someone else has the issue! Genius! 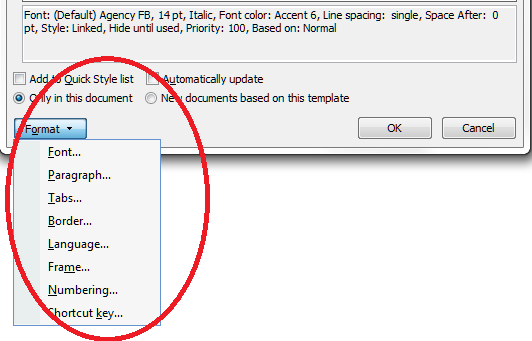 In Word 2010, enable Japanese in File/Options/Language/Choose Editing languages; re-start all Office programs; uncheck “Snap to grid…” on the “Comment Text” style definition, and… viola! Single-spaced comments!! Liz- I am working with Word 2013. Ever since I’ve been working with that version, I can no longer see numbers in my comment boxes. So when someone I’m working with on the phone says “I’m on comment 23,” I don’t know what they are talking about. I didn’t see that addressed here but I may have missed it. Thanks! Hi Liz. I am having the same issue as Ruth W where the comments are no longer numbered? I tried the link you gave and it’s no ticked, so I’m at a lose? Click inside a comment balloon. 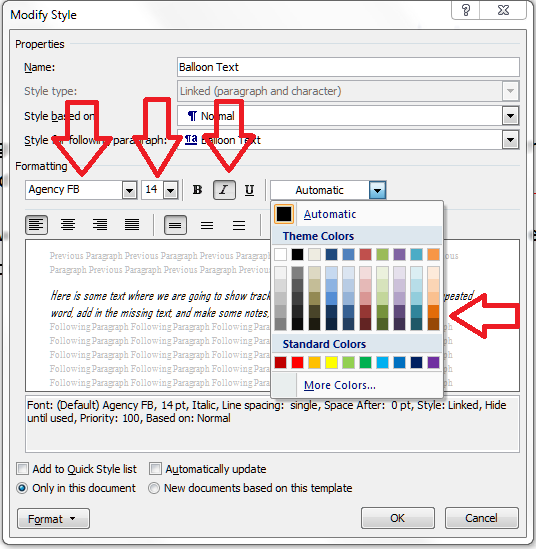 Press Ctrl+Shift+S to display the Apply Styles pane. Check the style name is “Comment Text”. Choose Format, look at the drop down, click Numbering, select a numbering scheme. OK, choose if you want Word to do this from now on. Liz, thank you for this suggestion. I tried it just now and ran into the following problem: only one or two comments get numbered, and not all. Or,when I retried, comments got numbered but not consecutively – they probably numbered themselves according to the time I made them. Then I retried, and again only the current comment got numbered, while the rest remained unnumbered. I am at a loss. Interesting. I have to admit I haven’t tried this myself yet. I wonder if it only works properly if you set it up before you start rather than trying to apply it retrospectively. How annoying of Microsoft to do this! and the user would only fill comment against the name field and 1/2/3 against Level and Major/Minor against Severity field. Thanks for your question, Karl. That is not a feature that comes with Word as standard, I’m afraid. I am part way through my dissertation – and want to include a document with comment boxes in my appendix – when I copy it into the appendix – all the other pages of the appendix have the review pane – is there a way of restricting the review pane to just that one doc? I assume you want to include the document with comment boxes as an example or either the use of comment boxes or commenting in general. Remember that actually seeing comment boxes depends on who is doing the reading and what is set on their computer. So if you need these to be visible to all readers and printable, the bets thing to do is to bring up the page on your screen, do a screenshot, past that into a Word document and insert that as, if you like, an image of the page rather than the page itself, into your document at the relevant point. I hope that helps! Thanks a lot for this post. This really saved my day!!! You can change the colour of the tracked changes using Track Changes options (click on the down arrow in the corner of the track changes button if you can’t see the option). Hope that helps! Thank you, Liz, this series is very useful. Is there a way of preventing the “Comment” label to appear at all? I’m refereeing an article for a journal overseas and the fact that the label is in English might give away my identity. Any help will be much appreciated. Thanks for your question, Eugenia. I’m afraid you can’t change the word “comment” appearing in the comments boxes. However, I wouldn’t worry about it being in English. I did a quick and non-statistically significant poll of some of my overseas clients, and under half of them use their country’s version of MS Office, so over half of them will have Comment in English in their comments boxes. So I don’t think you need to worry too much about that identifying you. I hope that helps! Is there a way to change the actual word in the document so that it doesn’t match the bubble color as the comment bubble? I would prefer if the word in the document that is attached to the bubble is only underlined. I don’t want it to be highlighted pink like my comment bubble. Thank you in advance! This page has been so helpful! Hi Jackie, thanks for your question. 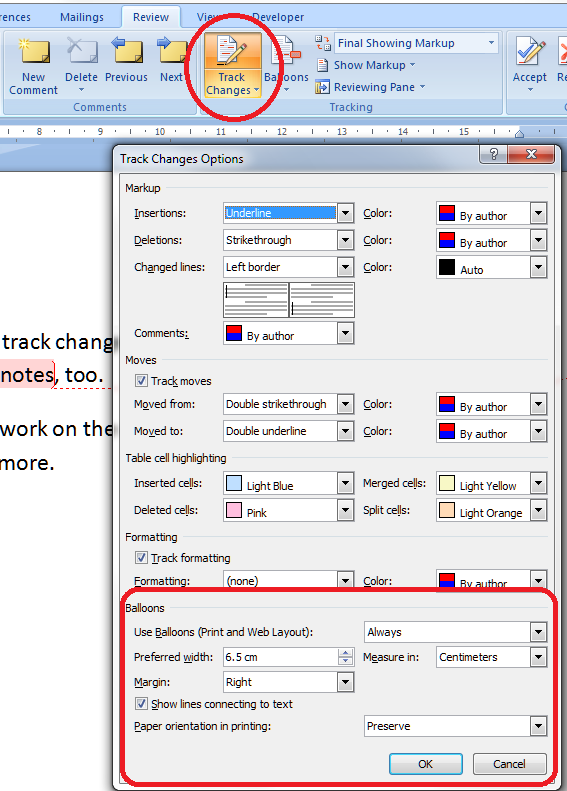 You can’t stop it highlighting the text in that way, although you can change the colour it uses in Track Changes / Track Changes options (see my Customising Track Changes article for more info https://libroediting.com/2012/10/03/track-changes-2/ ). That will help if it personally annoys you. However, how you set your Track Changes up will not affect what your client / the author sees, as Track Changes is individual to your computer rather than universal. I hope this helps in some way, and glad you’ve found the article useful! Everytime I CTRL F, the navigation pane on the left pops up, and also a “comments from” pane pops up at the bottom of the page. How can I turn the “comments from” pane off? I have ballons on and can navigate through the document using these. The “comments from” pane does nothing but take up page space and is annoyting. Thanks for your question. I’m trying to work out how this has happened, as I can’t replicate it. Which version of Word are you using, and for PC or Mac or on a mobile device? Hi Liz, I’m using Word 2003. Your post and the additional comments from other 2003 users were both very helpful in fixing the “small comment/balloon font size” problem I just came across. 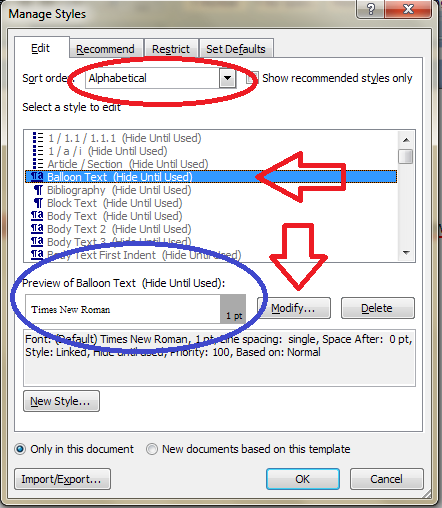 Is there a way in Word 2003 to globally accept just Format changes that appear in Track Changes, so that just those balloons disappear from the right margin? Thanks. Hello there, I’m afraid with the comments balloons, you can only delete them individually as you accept each change. However, you can set track changes to not have formatting changes in balloons, and then accept all changes, if that helps. Good morning. I found your post interesting but have a different type of question. We use an application that creates an auto text from a line of text with strike through and underlining plus a comment box. This is loaded into a template so that our whole staff has access. The process worked perfectly in 2010, but we now have one machine with 2013. That machine deletes the comment boxes from the auto text entries if the operator adds an auto text to the template then saves the change. Any ideas? Hm, that sounds quite complicated. Is the application that you use a macro of some sort? We use a Visual Basic program that was written for us. I have also contacted the person who created it to see if he can offer any suggestions, but so far he hasn’t found anything. I suspect it is something to do with the way that Microsoft has “improved” the comment box function. It works perfectly in 2010. Thanks for the clarification – I think this is really beyond my experience or ability to comment, but you never know, someone might come along and give you a solution. There is a lot of broken glass in Word 2010. I wish MS would sell us a program that works perfectly!! It’s a great tool for replacing the typewriter. If you’re a professional, you’re beat; and yet the whole world keeps buying MS garbage. I feel much better now :). Hello, and thanks for this article. The difficulty I am trying to surmount is that I have a half dozen generic comment balloons I wish to include at the beginning of each poem I review. The poems of course each have their own particular and peculiar Word formatting. I just wish to insert my generic overall comment set above the title of the poem. I can’t seem to make the compare or combine functions work for me, using the workaround mentioned here in 2014. “Accept all changes; Save document; Open changed document and original document using the “Compare” feature; Produce a new document with all tracked changes showing.” I may next try to make a template with the comment balloons embedded, but fear that will also contradict the original poem formatting. Help! Goodness. I just found a simple answer to my own question. 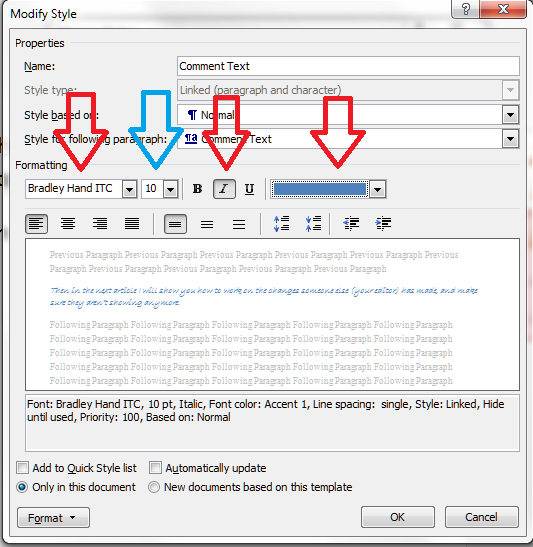 In Word 2010 DRAFT view, comments can be readily cut from one document and pasted into another. Thanks again for what you do. Oh, good, there you go! Thanks for sharing your solution and good luck with your complicated documents! Word comments are as frustrating as they are useful. I’ve used this post several times to wrestle them to the ground! I’m having an issue where the date/time associated with the comments in my document changes. Rather than being the date/time I originally made the comment, it appears to sometimes update to the date/time I recently opened the document. It is not consistent though. I’ve looked through the settings and looked online, but haven’t found a cause or fix. Any suggestions? In the Insert menu in Date and Time (along to the right) there’s an Update Automatically tickbox, and I wonder if that has an effect on the dates and times on the comments? It’s worth a try. Let me know. Thank you so much. The hot pink comments were making me crazy. (Or crazier. 🙂 ) Thank you for this solution! How do you spellcheck the comments in balloons? I have tried spellchecking the entire document, but the comments in balloons are not reviewed…. I love you for this post! This is very informative. Thanks. When I insert comments from a macro, I get an annoying “Comments from:” pane showing up on the bottom of the screen. Is there an easy ways to keep this from happening? It is unnecessary and annoying. If you want the comments at the side, use the Reviewing Pane menu in Review – Track Changes to move them. If you don’t want to see the comments, turn them off using the Track Changes and Show Markup options in the same place. Hope that helps! An additional request. I spend most of my day commenting on students’ Word documents, often on a small laptop. I want to reduce the width of the word 2013 window to the minimum. Which would mean showing the document only within the page margins. But the View>zoom>text width command leaves a narrow margin on the left and a full margin on the right, with the Markup Area to the right of that. And a change to the % size seems to reset all the settings. Is there any way to reduce the document view really to Text Width, while leaving the Markup area there? Screen space is too valuable to leave blank margins. Then is it possble to expand/contract the % view setting of the word window without altering the contents of the window? This will allow me to change the apparent font size without the window being reformatted. Thank you for your question. I usually play with the size of the window my Word document is in until the left margin is against the left edge of the window and the right shows my comments, etc. But changing the size using the percentage slider at the bottom of the window doesn’t change the layout or settings of my window, which makes me wonder if you’re in the correct view – are you using Print Layout to view your document? I hope that helps, someone might well come along with other suggestions, too. You can also change the size of your comment balloons which will affect the width of your markup area. Hi Liz, I’m a little late to this party but I wonder if you can help. I’m reviewing a document and adding text responses within existing comment balloons from other users; I’d like to differentiate my text from their using boldface, but the boldface attribute is quite often lost from one save to the next and I have to laboriously re-bold my responses. Is there a setting I can use to preserve comment text that is not all one attribute, or do I have to create a separate balloon for each response? Thanks in advance! Thank you for your question! What I do in this kind of situation is click on the comment I want to respond to and then click “New Comment” which will add a comment balloon directly under the first one. This will contain your comment only, with your initials at the start, making it clear who it’s from. This is the way that’s usually used, and will make sense to everyone reading the document as quickly and clearly as possible. I hope that helps! This awesome article probably provides the most in-depth and most complete information about customizing Word comment boxes/bubbles on the entire web! The reason for this is that we fax a lot of documents with comment bubbles, and the background color of the bubbles impair fax quality such that sometimes you can’t read the text in the comment bubbles anymore after the document has been faxed. Therefore it would be amazing if Word (2010 in our case) could be set up such that there is no background color in those comment balloons! Hello David, thank you for your comment. I’ve done some poking around and some checking, and it looks like there is currently no way to change the background colour of the bubbles! Apparently, people have been feeding into updates that this is not great, so they may change for future editions of Word. It may be worth trying Word 2013 or 2016 as the comments look different in those and aren’t always coloured, but that’s all I can offer, sorry! First, you set the color for the comment boxes to “black” in the Word Comment Options. The lines and borders of the comment boxes/bubbles then become black, but the fill is still grey. Then, interestingly, the grey fill is not printed black but white. However, this only works on printers that actually report themselves as noncolor, which some color printers don’t, even if you set them to greyscale. Goodness me, that is complicated, but thank you for sharing! Hm, I’ve never been able to make that work. Have you tried highlighting the first column and choosing for the comments to be on the left, then highlighting the second one and choosing right? I don’t think that will work, though. Also, do remember that whatever you set it up to do will be different from any other readers’ view, as it’s personal to our own computer, not the document. Thanks for reporting back and sorry that didn’t work. Sometimes if the lines linking the first column to the comments on the right are overlapping the second coloum and hiding the text, I edit the second column first, then the first one, so I can see all the text more easily. I am working on Nepali text which is written in Devanagari script. I do not want to change the signals like ‘Highlighted’, ‘Formatted’, Comment and comment no. I only want to arrange a setting where I only want to write in Nepali fonts in the comments. I did try following the instructions on this page but ended up having everything changed and I had to revert it back to what it was like in the beginning. I would be very thankful if anyone understood my concern and tried to help. Thanks! NB: The keyboard layout for Nepali fonts is completely different to the English characters. Thank you for your comment. Unfortunately, when you change the language in the comment boxes, it will change the whole thing, not the text. But I will leave this up in case someone has a solution. However, if you’re commenting in Nepali font, does it matter if Comment 1 etc. is also in that text, as presumably whoever is looking at the comments will be able to read that, too? I’m just curious. Hi, Liz. You seem to have solved everyone else’s problems so I am hoping you can solve mine, as well. I have Word 2013 and from the time I first started using it when I click on the Review tab and insert a new comment it would appear showing my name and my Microsoft “account picture” plus the typed comment. Now the account picture has disappeared and all you see is that icon of a generic person. Because I’m a medical editor who is constantly working on files with comments from many different people the photo is actually useful because at a glance I can whiz through a 40-page document, just slowing down when I see the photo in order to see if people have responded to my comments. I have no idea why it disappeared. It may or may not be related to a time when one of the docs for whom I was doing editing asked me to substitute his name for the comments so it would appear all the comments were from him. I later changed it back to my name and initials. I can’t honestly say if that’s when the photo disappeared but it was probably at least close to that. So….whether or not it’s related to that, any thoughts on restoring the photo? Hm, I didn’t know you COULD have the picture on it! Looks like you need to do File – Options – General and change your name to be your logged in Google user name, or File – Inspect Document – Privacy Options and there’s a dropdown there, most people say that only changes the document you’re directly working on, but worth a try. Hope that helps! Hi, Liz. If you click on the Review tab and then the arrow to the right of Tracking it brings up “Track Change Options” and one of those is “Pictures by Comments”. I can turn that on or off but that just either shows the little generic icon or removes it. The picture that has always been there previously, the one associated with my computer and Microsoft account, does not reappear in place of the icon. I have googled this for hours and your answers here seemed to be the only thing I could find with related information. I think you have a different version of Word because not all the options you show in your comment actually appear under File with my version. I did find the Trust Center and Privacy Options going through a different path but there’s nothing there related to this. And if I click on File, Options, General, then under Personalize your copy of Microsoft Office it shows my user name as the same as my Google user name and shows my initials correctly but there’s nothing there related to a photo by comments. So thanks for trying! Oh fabulous, I’m so pleased! I think I probably need to write a post about solving this, don’t I, so people can find the solution easily in the future. I really appreciate you reporting back and so glad I could help you sort out the issue! Hi Liz! When I write review comments in Word in the colored balloons in the sidebar, quite often the text I am writing is only shown in the balloon but will also pop up in a separate grey square, partly covering the balloon in which I am writing. I guess the function is meant to help give an overview of the full text that at the moment is present in this specific balloon, but to me this is merely visually annoying. Do you know how I can switch off this function? Oh, that’s a bit odd! Which version of Word are you using? Hm, I can’t seem to replicate this myself. I’m getting a grey box with no text but the date and time and my initials if I hover over the balloon, and a grey box with the full text of the comment when I hover over the text I’m commenting on, but not the full comment in a box covering the comment. Would you be able to send me a screen shot to liz at libroediting dot com? I can’t promise I can resolve it, though, of course! Liz, thanks for your response. I can of course send you a screenshot, thanks for being so accommodating! – , but don’t know if there is a need to, since you have touched upon my problem in your last comment. You say that there appears “a grey box with the full text of the comment when I hover over the text I’m commenting on”. And it is exactly this grey box I want to go away! Even if it doesn’t fully cover the comment, it covers some of it (perhaps more on my PC than others, since I use large font size). So if you could provide me with the recipe so this grey box you mentioned doesn’t appear my problem is solved! I was talking about the grey box that appears in the actual document, not the one associated with the comment. In my view, the grey box that appears in the document contains the text of the comment. The one that appears by the comment only has the date in. File – Options – Display – untick “Show document tooltips on hover”. Thanks a lot – your suggestion worked like a charm! It will save me lots of irritation. Ah – I’m pleased that did what you needed it to do! I’m working on a resume that has narrow margins to maximize the amount of content that can fit on a page, and my client’s comments are covering the text at the far right. I can’t figure out how to adjust the comments so that they don’t cover the last quarter-inch of text. Do you know how to move the comment boxes further to the right so that they don’t cover the text? I’ve tried putting them on the left, but then they cover the text on the far left. I’ve also tried adjusting the comment width, but that doesn’t help. The comments still cover the text; they just don’t display as far beyond the edge of the margins. I’ve had this problem before, but it seems to be occurring more often lately. It’s driving me crazy because I can’t see the words and punctuation at the far right of the document, which is making editing a nightmare. Help! Have you tried moving the comments to the top or bottom? Can you change the margins while you work on the text then re-lay it out at the end? Those are the only things I can think of – sorry! Thank you for this article! I just discovered your blog as I was trying to figure out how to change the font and point size of the text in my comment balloons. When I edit documents for authors, I always change the text of the main document to Calibri 12. I would also like the text in my comment balloons to be Calibri 12 so that if I copy and paste something from the main text into my comment balloon, the font and point size will be the same. More importantly, I often suggest in my comments alternate wording the author might want to use rather than arbitrarily make the changes myself. If the author does want to use the suggested wording, it’d be great for him/her to be able to copy and paste my suggestion into the main document and then have the fonts/point sizes all be the same. Is this possible? I’ve tried doing what you suggest, but I must be doing something wrong because the point size is still coming out smaller when I copy and paste something I wrote in a comment balloon into the main text. Thanks! This is Heidi again. I forgot to mention that I have Word 2016. Thanks again. Thanks for your question. I’ve tried to replicate this and it hasn’t worked for me – as in when I pick up the text and paste it into the main document, it’s the same size. Did you change the Balloon Text font and point size? I can’t seem to view comments made on deleted text. They are almost invisible and show as a very thin line in the text, with nothing displayed in the right margin (except for the deletion itself). The only way I can find to view the comment text is to switch to “Balloons in All Markup view show: Comments and formatting” under the Track Changes Options menu… but this automatically toggles the revisions to show inline (which I find impossible to work with in a heavily tracked document). Is there a way to make ALL comments visible in the right-hand margin (even those on deleted text) and keep all the revisions in balloons also? It’s annoying when they think they’re being helpful and it’s actually made worse, isn’t it. I can’t find a way to do that unfortunately. The only thing I can suggest is putting the comment on the deleted text on the space or even the word before or after the text you have deleted, and heading it “deleted text”, like I do when I want to comment on a footnote but have to comment on the footnote number in the text. I hope that helps a bit. And I hear you! Thank you for your question, Jelena. You can remove your name as reviewer on the document and the time/date stamp by going to File – Info – Check for Issues – Inspect Document. Make sure Document Properties and Personal Information is ticked, then click Inspect. Click Remove All by Document Properties and Personal Information. Close, then Save. What I do is, I use “C” as my “Initials” in “Options -> User Information”. So I get [C1] … [Cx] on the comment bubbles, and everyone can read “Cx” as “Comment #x”. Thank you, that is certainly another way to remove the name, although it doesn’t cover the time/date stamp issue and the only way I know to remove that also removes the name anyway!